Charlie's Chalk Dust Drama Swirl E-Liquid - Money Off! This item is currently unavailable for purchase. Please call us on 020 7501 1108 for more details. A sweet and indulgent e-juice, the Charlie's Chalk Dust Drama Swirl E-Liquid is designed for those with a sweet tooth. An apricot glazed pastry, this e-liquid adds a touch of luxury to vaping. Charlie's Chalk Dust apparently started with some hot dogs, a distaste for cab drivers and a potential spiritual intervention. How much truth is in this story remains to be seen, but the results are the same; creative and inventive flavours that create a smooth vaping experience. Drama Swirl E-Juice comes in one size and three different nicotine strengths. 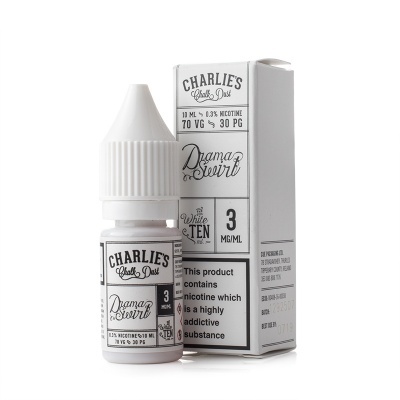 Some of our stock of the Charlie's Chalk Dust Drama Swirl E-Liquid is nearing its expiry date and, in light of this fact, we are offering the affected stock for a discounted price of £0.00. Act quickly, as this offer is only available while stocks last! When a blend works, why change it? Fruit and pastry is a match made in heaven, especially for those with a sweet tooth. The blend of apricots and pastry provide the perfect balance of an indulgent delight for those wanting something sweet. Disclaimer: Please be aware that this product contains nicotine, which is a highly addictive substance. E-cigarettes are not intended as an aid to smoking cessation and are intended only as an alternative to other tobacco products. What do you think about this product? Let everyone know! Please note that this product is not returnable, due to it being a discounted item. This product has been discounted for clearance and we are therefore unable to accept returns on this product. Please note that this does not affect your statutory rights as a consumer. If you would like any more information regarding our Returns Policy, please visit our Returns Information Page or call our customer care team on 020 7501 1108. If you have any questions about any of our products, our Customer Care Team is waiting to hear from you! Get in touch via the "Contact Us" page or give us a call on 020 7501 1108. Our team has wide experience with all of the Vape Mountain products and can advise you about our ranges or anything else you might have questions about. Please note that you must be 18 years old or older at the time of purchase to order from Vape Mountain. We age verify every user that buys from the site and orders placed by persons under the age of 18 will be cancelled immediately and refunded. For more information about age verification and how it works, please read our post here. This product is usually dispatched by Royal Mail 1st Class Post or courier service and delivery is FREE if you spend £20.00 or over. Delivery normally takes place within 1 to 3 working days after placing your order. Our team of warehouse wizards pick and pack your order personally to ensure you receive your package in perfect condition. For up to the second dispatch information, talk to our team on 020 7501 1108 (09:00 to 17:30) or email helpdesk@vapemountain.com. We're here to help. All major credit and debit cards accepted. Secure payment processing from SagePay and PayPal. Lines open from 9.00am to 5:00pm, Monday to Friday (excluding Bank Holidays and Christmas). Please leave us a message at all other times and we'll get back to you as soon as we can. As a responsible retailer, we'd like to highlight any issues and dangers associated with vaping and/or smoking before you shop with us. Please click here to read all about them.